During tonight's Elk Grove City Council meeting, Mayor Steve Ly was criticized for his lack of follow-up on numerous concerns expressed over the last several weeks on race relations in the city. 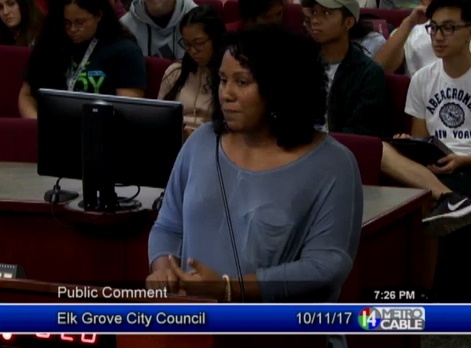 The comments were made by Elk Grove resident Summer Thomas during the public comment portion of the meeting. Summer said she was disappointed with Ly's follow up on the concerns. Those concerns came in the aftermath of a racist message left at an African-American owned Old Town Elk Grove business. The hate message, which was placed at the front door of Dream Girls beauty salon, has sparked a community-wide discussion on race relations. In her comments, Thomas whispered the word race and said "and that is how I feel it is talked about - whispered. Everything is going on behind closed doors." Thomas noted that when residents started showing up at council meetings to address the issue, she felt that she would receive more outreach from the council. Following the discovery of the hate message left at Dream Girls, which she said left a stain on the community, the city council had reached out, but since then nothing has happened. "What tends to happen is, is that you reach[out], when there is media on you," Thomas said to Ly. "You reach when you are trying to do damage control." She went on to tell Ly that he needs to continue his reach out on a continuous basis. "If this matters to you, and you can continue to campaign for this position, and the people vote you into the position, is it not your job to campaign for the people," Thomas asked. "And right now it is race relations, its hate that goes on in this city." Thomas said the matter should have placed on the city council's agenda for formal discussion, and that Ly has not kept stakeholders "in the loop." "I want to know what you are doing," Thomas said. "I don't want to hear about what you can't do. Come to me the way you did when you found out about the situation and tell me what you can do. You were able to reach out to me before, let's not act like you can't get in touch with me again."